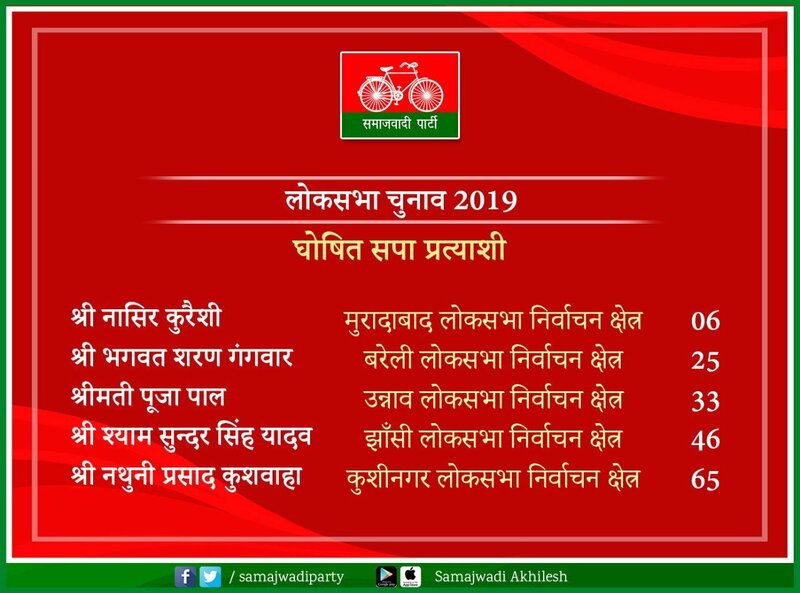 Samajwadi Party released another list of nominees for the Lok Sabha elections. The party has announced five candidates.Spa has nominated Muradabad Lok Sabha seat from Nasir Qureshi, Bareli to Bhagwat Sharan Gangwar, Pooja Pal from Unnao as candidate. On the other hand, from Jhansi, Shyam Sunder Singh Yadav and Kushinagar have given ticket to Nathuni Prasad Kushwaha. Let us tell you that SP is contesting the 37 Lok Sabha seats in the state, while the BSP has 38 coalition seats.